On Race Day, you can visit our interactive I Am Komen® booth to learn more about breast self-awareness and how to make a Declaration. You can spin the wheel for prizes and take home breast health education information. You’ll also see our Rovers in the bright green I Am Komen® shirts; they’ll be sharing the message of early detection, distributing EduCards and I Am Komen® stickers. All throughout the Race, you’ll see and hear our efforts to educate, empower, and engage our participants. What is a Declaration? A Declaration is an emphatic statement, a promise or commitment to take one or more action steps that may reduce the risk of breast cancer. A Declaration is also a self-empowered choice to join the Komen community in doing whatever it takes to end breast cancer forever. Race participants can go to the I Am Komen® booth, spin the wheel and answer a ‘Myth or Fact’ question, write a Declaration on a dry erase board and take a photo in our photo area. You can then post your picture (using #IAmKomen) online via Facebook, Twitter, or Instagram. Or, Participants can visit IAmKomen.org, click on the “Make a Declaration” icon in the center of the page, and follow the prompts. Once you’ve made your Declaration (and uploaded a picture of your Race day experience), you can ‘declare and share’ your Declaration and inspire others to join Komen in the fight against breast cancer. For more information about the I Am Komen® program, breast health information, and ways that you can personally get involved, please visit iamkomen.org. If you’re interested in learning more about volunteer opportunities at our Race, including becoming an I Am Komen® volunteer, please contact us or visit our Volunteer page. 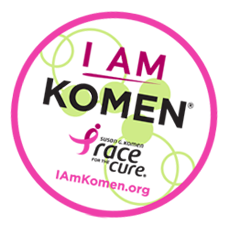 Our I Am Komen® program is ideal for volunteers of all ages seeking to get involved in the Komen Race for the Cure®.